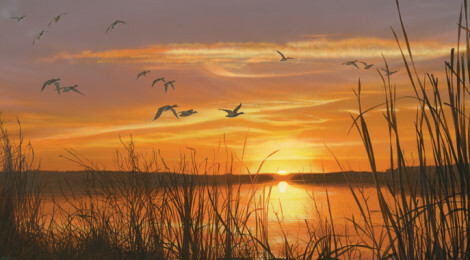 Scott Storm’s painting entitled “Sunset Silhouette” is a perfect image for a January cover of TEXAS OUTDOORS JOURNAL. It captures both the opportunity to hunt waterfowl, as well as inviting water to fish. The painting’s title refers to a setting sun, that could well represent a year that has just passed. If it were untitled it could well be interpreted as a rising sun representing all of the outdoor opportunities that lie ahead in the months to come in the New Year. Storm’s painting is a great image to start a New Year, or even reflect on memories past. It is available as an open edition giclee on canvas with an image size of 18” tall x 36” wide. For more information on “Sunset Silhouette” and other works of art by Scott Storm visit Wild Wings at www.wildwings.com, or call (800) 445-4833.